Choose from a 90 minute driving tour or a 120 minute driving and walking tour. Travel the route taken by the herdsmen of long ago to bring their cattle to the mountain for the winter. This is a unique experience away from the main tourist routes and follows a 6 mile farm track over our mountain. The views of the Clare coastline along the Wild Atlantic Way are breadth taking. 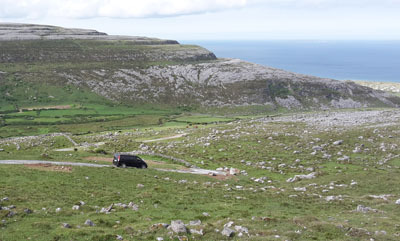 From the western mountain edge you will have unparalleled views of Galway Bay, the Aran Islands and Galway city. Beneath you observe the well preserved 16th century tower house, Gleninagh Castle, home of the O’Loughlin’s and the nearby Rhine Peninsula. Travelling inland towards the centre of the mountain observe the vast expanse of limestone paving in this karst landscape from aspects previous only known by locals. 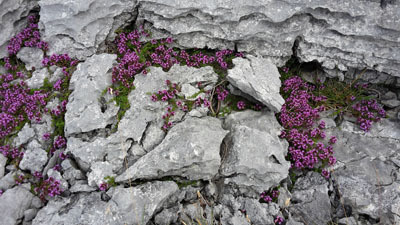 Enjoy the tranquillity of the Burren and the magical energy of the limestone paving. Experience the splendid isolation of the burren, far from the crowded tourist spots below. There are relics everywhere of mountain life thousands of years ago, such as forts, turf tiles, and magnificent examples of hand built stone walls, a tradition continued to day. Travel in comfort while learning about the wonderful archaeology, history, habitat and farming in the Burren mountain from the people who now farm it. From early spring the mountain is like a flower garden and you will learn about the exotic mix of flowers that thrive here from different habitats and climate zones. This is a botanist’s haven. You will see the fertile Cahir Valley and the Cahir River, the only continuous over ground river in the entire Burren. Our walking tours are ideal for nature lovers or those looking for something unique, an up close experience with the Burren landscape as we walk along a relatively easy 4 mile track. Small groups only – up to 7 at one time. Tailored tours and educations tours by appointment.